Recently my boyfriend got into Doctor Who (Thank heavens... Actually, thanks Ryan, love you long time.) and he decided to do a little "viewing party" over at our place with some of the most dedicated Whovians we know. 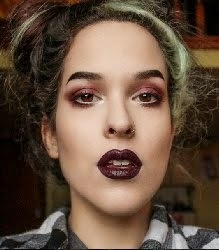 What went from a simple "Hey, lets invite some friends over to watch TV" turned into me searching the whole city for giant marshmallows and making elaborate food plans. 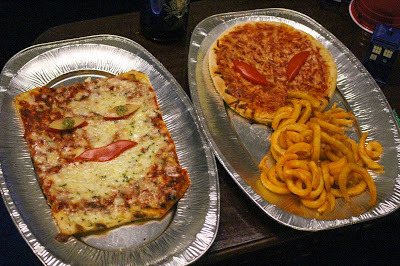 We wanted simple party food that could be easily made and eaten throughout the night. 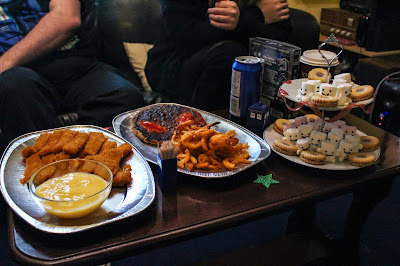 Other than the obvious fish fingers and custard, we had to get a bit creative for the rest. We immediately Googled "Doctor Who food" for some ideas and I gotta say, people are crazy imaginative. We decided we'd stick to making things from pizza and fries, which would be a vegetarian option loved by all. Many sweets were also involved in the planning. 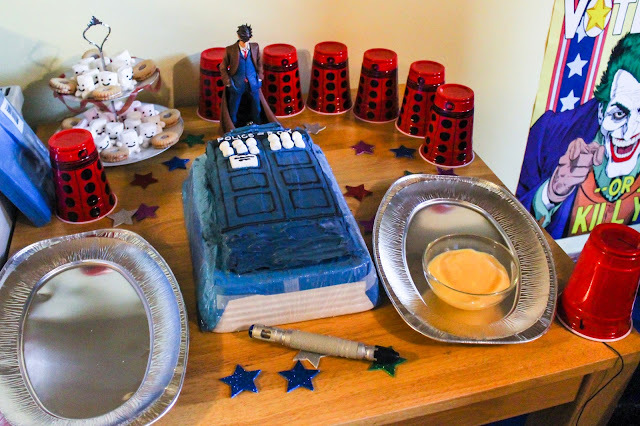 We would have done drinks as well (Sonic Screwdrivers anyone?) but it was a BYOB situation. 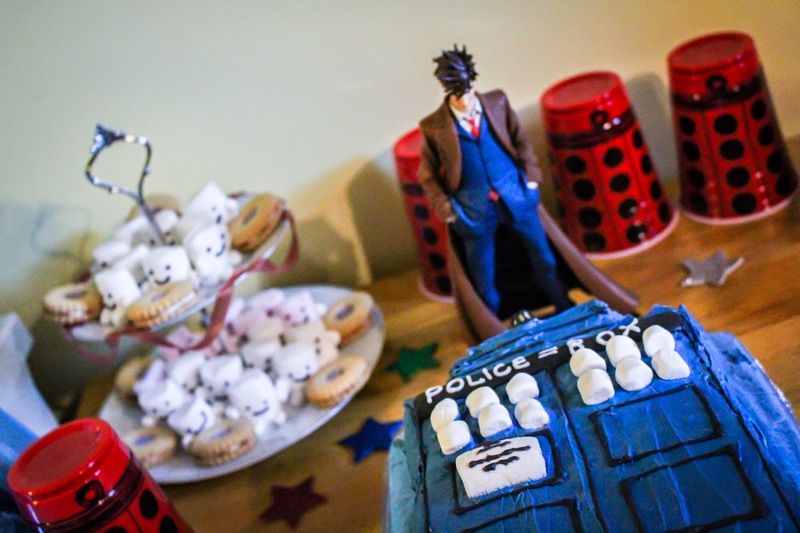 We both agreed some sort of Tardis food would be needed, and a cake seemed like the easiest route to go. 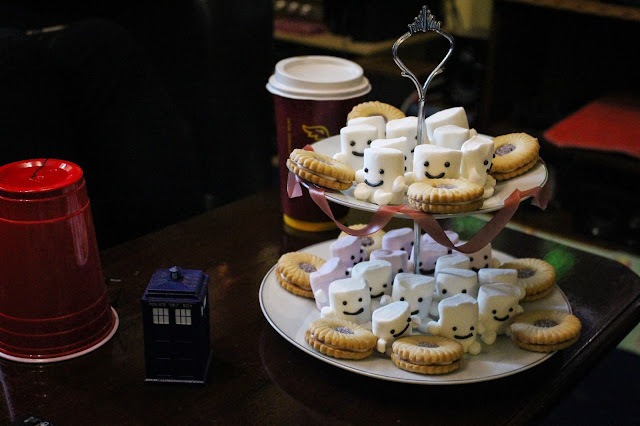 I wish I could have made an actual little Tardis, standing vertically and all, but my little light-blue (I have a hatred towards supermarket food colourings now), marshmallow-windowed, horizontal-laying creation would have to do. 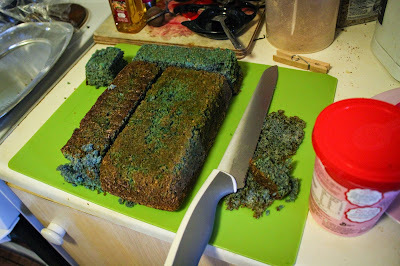 All I had was a bread pan, so I made 2 cakes and Frankensteined my way into Tardis production. 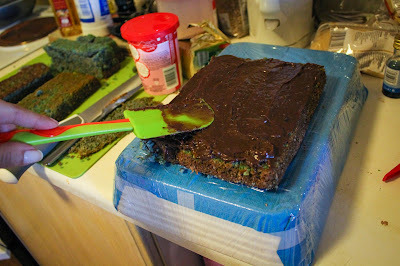 Since all our guests were Irish, I decided to shake things up a bit and fill the cake with a traditional Brazilian sweet called brigadeiro, made with condensed milk and powdered cocoa. The weirdest part of sourcing things for the party was my nearly heroic quest for giant marshmallows. I had seen them the week prior at Tiger (a store that sells really cool home decoration stuff for REALLY cheap) and they're always in stock at the American candy shops around town. I also saw 3 different kinds of marshmallows at Dunnes the day before I decided to buy them. For some reason, all marshmallows disappeared from the shelves of Dublin's shops. Either everyone else decided to make Adipose too, or I'm not quite sure what happened. We had to settle for normal sized marshmallows (which were a little on the small side) and we cut mini marshmallows in 1/4 for the arms and legs. I attached them and gave them some friendly smiles using royal icing. I also spent a lot longer than you'd think drawing up some Daleks onto the party cups and made some fez party-cup-hats for all invited. I sprinkled some stars over the table, positioned my prized possession as a table centrepiece, and all was good to go! I had thought of substituting the custard for a yellow savoury sauce like Hollandaise but thought "This might be the only time we ever do this, so might as well have the actual stuff!". Even though in the series they substituted the fish fingers for toasted coconut breaded cakes. Everyone was curious, to say the least, about trying out the famous combination... And it was surprisingly good! I would have it again if the opportunity ever arose. The burned ood face is because he had gone red eye!